I saw a similar format with IMDb.com when their site was down and post some dialogue from some wonderful films. I will try to not make this a regular thing because we want new comics 🙂 Hopefully this was nice post for the week. This really happen last Wednesday. I had a spontaneous sketch session with Justin Yang during the session he mention the picture above, so I had to share. 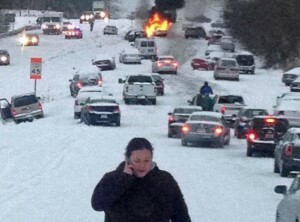 It seems North Carolina was just as unprepared as Georgia was several weeks ago. Patreon co-founders Sam Yam (left) and Jack Comte met as roommates during their freshman year at Stanford University. Credit: Patreon Inc. I mention before how Kickstarter is ban-na-nas, well here is alternative method for funding ongoing creative work instead of big project campaigns in Kickstarter. In some cases some participants are trying to avoid using any advertising on their sites. Some comic creators I found so far on Patreon: Meridith Gran, Gordon McAlpin, Erika Moen, Paul Taylor, Zach Weinersmith. I will be sure to cite more. Best of luck to everyone.